KOKOMO, Ind. 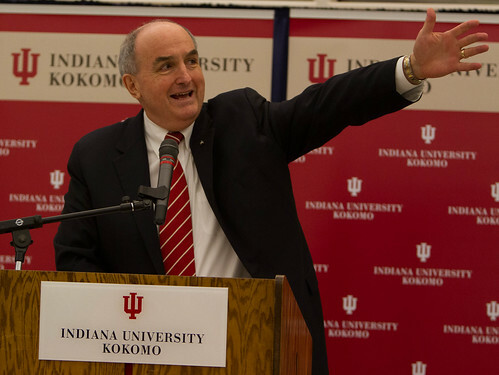 — More than 100 Indiana University Kokomo alumni, faculty, staff, and friends attended a reception celebrating the first-ever Homecoming, as well as a visit by IU President Michael A. McRobbie and the Board of Trustees. IU President Michael A. McRobbie gestures to a "Complete in 4" banner as one of the ways IU Kokomo is promoting on-time graduation of students.McRobbie updated those attending on progress being made throughout the university and on the Kokomo campus, and thanked them for their support. "This kind of progress I have described this evening could not happen without the dedicated and generous support of the alumni, faculty, students, staff, and friends of Indiana University," he said. "Your dedication and generosity have left an indelible mark on the university and are testament to the true strength of this great institution. Working together, we will continue to achieve our goals of true excellence in education and research." McRobbie highlighted just a few recent accomplishments, including the summer tuition discount, which resulted in a nearly 12 percent increase in IU Kokomo's summer enrollment; the on-time graduation award that offsets increases in tuition and fees for juniors and seniors who are on track to graduate in four years, and creation of several new schools, including the School of Public Health, the School of Philanthropy, and the School of Global and International Studies. At Kokomo, he noted the record-setting fall enrollment of more than 3,700 students, and the first season of athletic competition in the NAIA. "All of these gains are a result of the strategic planning that has been done on campus, and the implementation of those plans, and the entire campus deserves our congratulations," McRobbie said. Interim Chancellor Susan Sciame-Giesecke thanked those who attended, reminding them their support is needed to keep the campus moving forward. She encouraged everyone to look at plans for the Milt and Jean Cole Family Wellness and Fitness Center and the student courtyard. "The momentum is continuing," she said. "Our students are so excited; they can't wait to use the fitness center. We appreciate the support and partnerships that are making these facilities possible for IU Kokomo and for our students."